Getting support services from third-party vendors is not unheard of especially in Australia. Some large companies and government entities are happily contracting their maintenance support for their data centres and networking equipment from third-party maintenance (TPM) providers instead of getting it from the Original Equipment Manufacturers (OEMs). If your company is not yet working with one at the moment, I am quite sure that it is one of your agenda to investigate cost-efficient solutions to the augmenting cost of the OEM support. You are looking for ways to free up resources. You are looking for a good alternative to your expensive OEM hardware maintenance support. 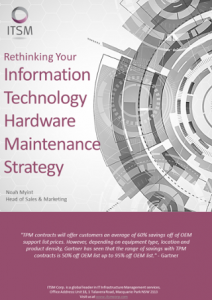 With the growing KTLO (keep-the-lights-on) expenditure—72% of the IT budget according to Forrester—and the more organisations consider hardware maintenance as “nonstrategic IT” spending, the more attractive TPM providers become. Tagged as a proven testing ground for global projects, Australia has a very mature ICT industry. According to the Australian Trade and Investment Commission website, Australia is a strategic location for a range of ICT activities because of a significant research infrastructure, highly skilled and experienced workforce, and technology-hungry, solutions-driven customer base. Based on the Australian Data Centre Services Market 2016, the overall market had an annual growth of 18.3% reaching $976 million in 2015 and is predicted to grow at a CAGR of 12.4% till 2022, with the market reaching $2.055 billion by 2021. A fertile ICT ground such as Australia, the most common question we hear from tech leaders is not whether they want to work with a TPM or not. And definitely not whether they do want a more cost-efficient solution to an existing OEM maintenance support or not. Who wouldn’t want to save cost, right? What we often hear is what hardware maintenance company are they going to partner with. How fast can they respond? Check how efficient is the company in handling issues from the first point of contact. Find out if they consistently meet the service level agreements (SLAs). Technical issue means downtime to your business so, it is important that the provider is able to act fast and provide resolution. How flexible is the company in finding a solution? Know if they are flexible with their SLAs. Can they offer improvement of your SLAs on your existing OEM support agreement? Find out the products and the EOSL (End of Service Life) support they can offer. How fast can the vendor provide the needed spare? Providers that have strategic warehouse location can get to your office quickly with the spare you need. Find out where they house their spare parts. If your office is in Sydney, would it be great if they have a warehouse in your vicinity? The engineer can be at your doorstep with your needed spare in just an hour or less. How skilled are the engineers? How qualified are their staff? Can they do the job right the first time? Is their price justifiable with their service? The cheapest may not always be a perfect choice. Base your selection on specific parameters instead. 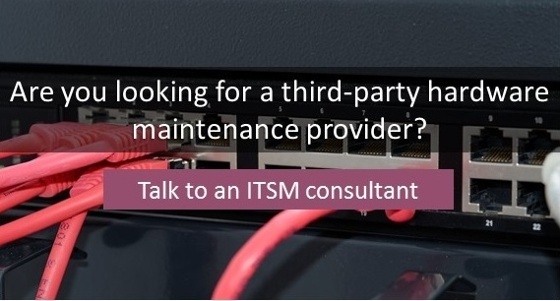 Want to know how ITSM can help you save hardware maintenance costs? Call us at +61 2 8355 1080 or email us at sales.au@itsmcorp.com.